Improve all areas of your warehouse operations, reduce guesswork and improve accuracy. Use Scanners to Streamline Your Order Process in the Warehouse. By using Barcode or RFID labels you can turn lengthy manual processes into one-step tasks. A single scan can acknowledge a shipment, pull up item details or update item counts. You can create custom labels through the Clear Spider system, or use existing supplier labels. Each item can store a unique location in their item details. Simply scan the item to find its associated location. Companies that use a FIFO method can also attach an expiry date to each item. To perform a cycle count simply scan the item, enter the quantity, and then verify any discrepancies. The system will update all inventory quantities in the system real-time. Within the system you are able to view and print, pick and pack lists. Through customization, paperless picking and packing is also possible. Lists can be uploaded to handheld scanning devices for easy and accurate processing. Many companies have seen a great reduction in picking and packing time when using digitized records and electronic devices. Want more efficiency? Our system also allows multiple users to be working on one order simultaneously. The work completed by one user is updated in real-time in the system so there will be no overlap between workers. When packing orders, our system can also determine the correct sized shipping carton. Many warehouses that use this feature have seen increased accuracy and reduced materials cost. With the Clear Spider system you are able to manage inventory transfers and removals. When inventory is being transferred from one warehouse to another, two orders will be created so that the transfer is properly documented and updated in the system. When an inventory removal is needed – whether it is for broken, damaged, or expired goods – our system is able to process that movement and update the inventory quantities. If the removal requires specific disposal, or repairs are possible, the movement can also be completed through return material authorization (RMA). 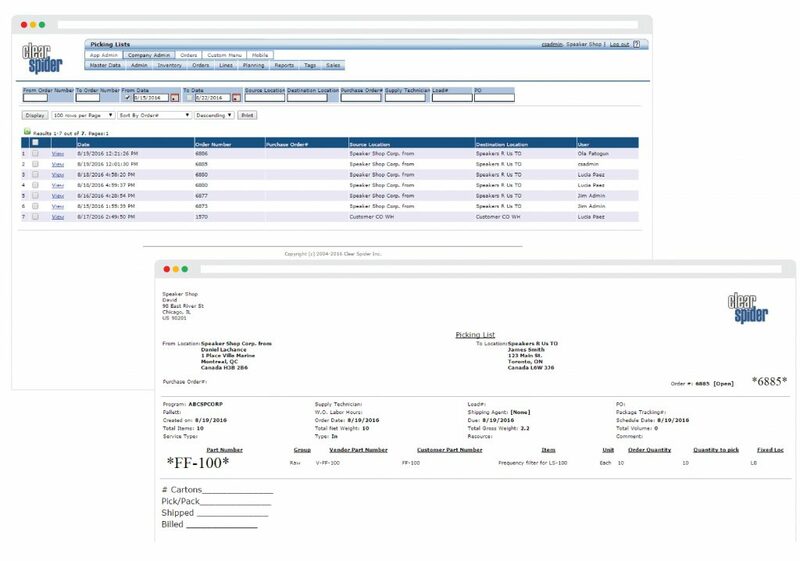 Manage inventory that is owned by the supplier, but in the possession of a customer, by giving both parties access to consigned inventory information. Processing orders separately, for parts that are commonly sold together, is difficult and slow. Kitting allows you to group related products together to increase order accuracy. With one click, our system can provide an overview of the inventory at any of your warehouse locations. See inventory levels at each individual location no matter who owns the inventory. We currently offer integrations with UPS, USPS, and FedEx. Talk to us about customization to integrate with other platforms. Each action completed in the system is date and time stamped, and associated with a username or ID. Always know who completed what and when it was done. Users working in different warehouses, or head offices, can have access to the same up-to-date information. This makes remote collaboration possible. You can set specific user roles so you choose who has access to what.